Sometimes you work on a painting and you just know at some point, it’s just not working. It deflating, especially since there always seems to be a little section of mastery. But like a movie scene that ended up on the cutting room floor, the painting never sees the light of day. But then there are times when you can just feel that it’s going to be good. When you were able to express visually what you wanted to convey and in a manner that is beyond typical. For me, “Morning Has Broken” fell into this category. I am always excited when this happens. For an artist who is striving to be included in top level national exhibitions, paintings have to be more than a duplication of a scene. Artists have to interpret the scene in such a way as to evoke an emotional response in the viewer. Easier said than done. 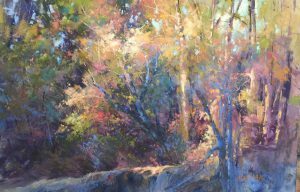 Today, I found out that “Morning Has Broken” been accepted into the American Impressionist Society 17th Annual Juried Exhibition. The show runs September 29- October 30, 2016 at the Howard/Mandville Gallery in Kirkland, Washington. This painting was also exhibited at the Salmagundi Club in New York City in the 2016 IAPS (International Association of Pastel Societies) 28th Juried Exhibition. When I have a painting that I think is a “show painting”, I like to try to exhibit it in different venues. Especially, since few paintings end up floating like cream on the top. 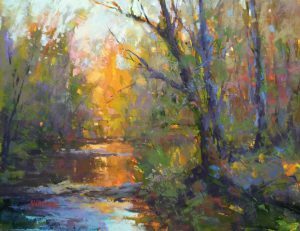 “Morning has Broken” has won 3rd Place in the Southeastern Pastel Society 2016 International Exhibition and is also in the UArt 2016 Online Competition Exhibition, along with my painting, “Ablaze”.